Bob Levey/Getty ImagesPeyton Manning has plenty of experience in front of a microphone. 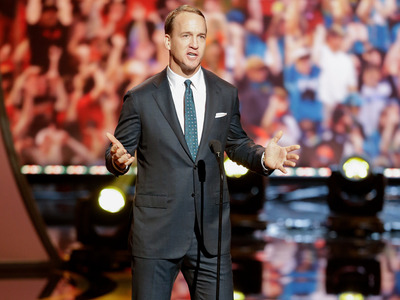 ESPN and Fox Sports are both trying to get Peyton Manning to serve as a broadcast analyst for them. ESPN would pay Manning well above what Jon Gruden was making for calling Monday Night Football games. There is still no guarantee Manning will move to the TV booth as he could still choose a position in an NFL front office. ESPN and Fox Sports are both trying to convince Peyton Manning to join their broadcast teams, and ESPN is willing to make Manning its highest paid broadcaster by a wide margin, according to a report from Michael McCarthy of the Sporting News. Both networks are willing to pay Manning $US10 million a year, per McCarthy. By comparison, Jon Gruden was previously ESPN’s highest-paid employee at $US6.5 million a year. ESPN wants Manning to replace Jon Gruden in the booth for its “Monday Night Football broadcasts,” while Fox wants Manning for its “Thursday Night Football” broadcasts as part of a “dream team.” That crew would include fellow Hall of Fame quarterback Troy Aikman handling the pregame show. Of course it’s easy to see why networks would be so desperate to grab Manning. Not only is “The Sheriff’s” football acumen legendary, but he’s long proven himself to be a natural entertainer off the field as well, with countless television commercial appearances stretching back over a decade. McCarthy also cites the NFL’s declining television ratings as well as the overwhelming success Tony Romo has had as a broadcast analyst as reasons networks are so eager to grab Manning. However, it remains to be seen if Manning even wants to go the broadcast analyst route. “Manning also is interested in a John Elway/Derek Jeter-type role in which he runs/owns a sports franchise,” writes McCarthy.